Your item is currently not available. Sign up below to get notified when it's available again! Earthy, intense; smooth, rich & big hints of caramel. Sumatran coffee has flavors that some find intense and huge on the palate. Those who love this coffee REALLY love this coffee. One of our most unique and most popular single origin offerings, this coffee is characterized by its striking earthy flavor and its rich, musky tones. A mellow acidity is accompanied by a full body swirling with complex sweetness. Our roast is just dark enough to bring out the deep caramel notes that intertwine with the slightly funky flavors that result from the coffee cherries wet hulling process. The finish is long and exquisitely sweet, an intriguing contrast with the rustic characteristics prevalent at the start of the cup. 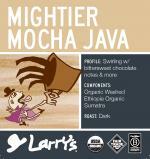 Our quest was to achieve the richness of a dark roast while retaining complexity of flavor. Ah, the sweet taste of success. 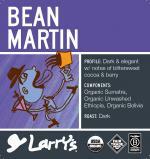 Heavier bodied, dark roasted blend of Sumatra & other Secrets. Sweet with hints of toasted caramel. 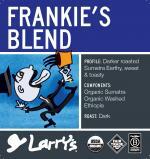 This traditional blend offers a medium-heavy body with loads of earthy spice. Distinct sweet berry acidity and chocolate liquor finish.